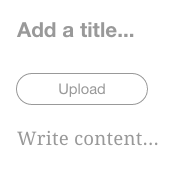 and you will be prompted to upload images. Click "upload" and select all of the images you would like to feature in the gallery. Once uploaded, you can re-order the images by dragging and dropping them in the appropriate order. To delete an image in the gallery, hover over the green checkmark until it becomes a red "x". Click the red "x" and the image will be deleted.